Chefs learning their craft are bound to generate plenty of dirty dishes. Three Classeq warewashers installed on the Roundhouse campus at Derby College are ensuring sparkling service at all times. The purpose-built £2.5m catering training operation has the capacity for 170 full and part time catering and hospitality students, and includes a working restaurant trading as the Engine Shed. Opened in September 2009, the new Roundhouse campus on Pride Park in the city centre also includes two commercial food operations – the Roundhouse Restaurant and the Grab & Go food-court style quick service site. The thousands of meals served each week generate a lot of dirty dishes, glassware and cutlery, all of which need cleaning to the highest standards. 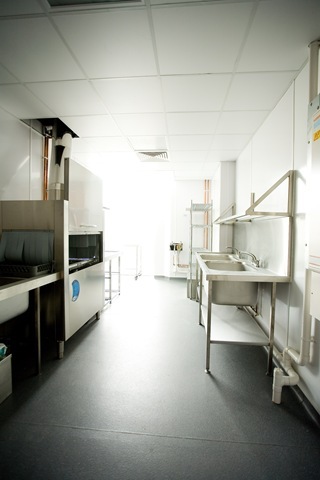 The Classeq warewashers on the site were commissioned through Chesterfield-based Catering Projects Group, which worked with Derby College specifying all catering equipment for the Pride Park development. An Alto rack dishwasher has been installed at the main Roundhouse Restaurant. This trades from 8am to 8pm, and can serve up to 1000 customers a day. In addition, the industrial architecture makes it a prestigious function venue, with up to 450 guests dining at such events, which take place through the week and at weekends. With many staff working at the site, one advantage is the Alto’s simplicity of use – new employees can be trained easily. The Grab & Go restaurant in the Stephenson Building is used by students and staff from the college for snack-style meals such as jacket potatoes and paninis. The Duo3 undercounter glasswasher installed at the Grab & Go is a workhorse, designed to cope with high levels of demand at peak time. “The food and service has to be quick, efficient and to a high standard,” says Tony. “There is no shortage of choice, with the new Westfield shopping centre just a minute’s walk away. Our facilities have to compete.